Noor is an Afghani refugee who fled to a Peshawar refugee camp with her family in 1981. During her families escape from Afghanistan her mother is shot and killed and her death ends up being the reason why the family gets out of the country at all, though they never make their intended destination of America. Charlie is an American aid worker and war vet who went to Peshawar to lead a demining project. His reasons for being there are kind of shallow as he just wants to earn some money to open a dive shop up in Belize and sees Peshawar as nothing but a good paying gig. 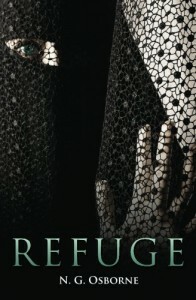 Refuge is the story of an unlikely love that forms between these two characters, but it is also so much more. This book was a quick read for me, it is fast paced and very enjoyable. And while it is a fast read the writing style kind of reminded me of Ken Follett books because there are so many different story lines that are woven together. I loved reading about the supporting characters just as much as I loved the story between Charlie and Noor. Aamir Khan, Noor’s father was a fantastic character. He sacrificed everything for his family and wants only the best for his daughters. Wali works with Charlie on the demining project until there is a tragic accident that leaves him minus a leg and a foot. Elma is a Dutch aid worker who ends up projecting her own relationship failures onto Charlie and Noor. Elma tries to force her will on Noor and when that doesn’t work she does something unforgivable. And then there were the sleazy jerks Tariq and Ivor. Tariq is Noor’s brother. He is a religious zealot who was gotten himself involved with the Mujahideen led by a Saudi Price. He is power hungry and thinks the world owes him something and he is perfectly willing to destroy his own family to get it. I actually HATE him. And let us not forget Ivor. Everyone knows he works for the CIA but they aren’t quite sure what he does. He is manipulative and self-serving and it is hinted at that he is involved in some very dark business. Peshawar really comes alive in this book. The descriptions of poverty seemed very real to me and while I read I could easily imagine the crowded city streets, the camps and the markets. This helps to understand what Noor’s life is like and why she longs for something better. I am not going to say much more because it is hard to not give away spoilers so I will just say this. I wasn’t upset by the abrupt ending but I also had no idea this was going to be book one in a series. Part of me thinks this is awesome and another part of me screamed NOOOOOO WHY CAN’T THINGS JUST BE HAPPY! So I have signed up on the author’s website to get updates on the arrival of book two and if you liked this book I recommend you do the same. Lastly, I would like to thank the author for sending me this book as a part of the Goodreads First Reads program.